TOP SPRINTER. Trip To Heaven will be looking to outrun stable companion Carry On Alice in Saturday’s Grade 1 Computaform Sprint over 1000m at Turffontein. 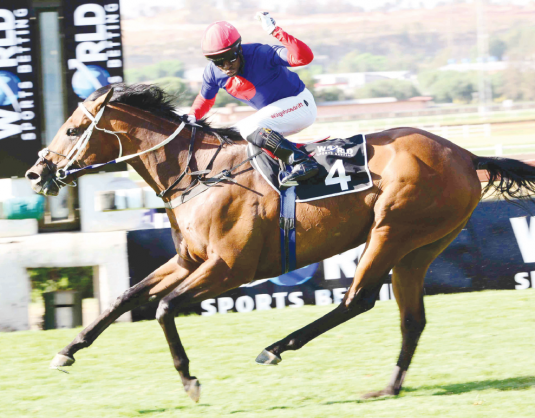 Legal Eagle has been priced up a strong fa­vourite to win the R4- million Premier’s Cham­pions Challenge (Grade 1) over 2000m at Turffontein on Saturday. Trainer Sean Tarry has followed the same path as he did last year with his charge. Legal Eagle won the Grade 1 Horse Chestnut Stakes after his return from the Cape and fol­lowed it up with victory in the Champions Challenge. He has again completed leg 1 and should be hard to oppose in the double. He looks a banker in all bets. Stable companion French Navy appears to have found his form at the right time and should get into the money. Brazuca has come back to best and won a Pinnacle Stakes over this course and distance full of running. He could prove the big­gest danger despite being 6.5kg out with Legal Eagle. Master Sabina ran below form last time but is best over this course and distance and should do a lot better. Filly Nother Russia is as honest as they come but will tackle this class for the first time. She won’t go down without a fight. Heavenly Blue is shaping up as another banker on the card when he runs in the R2-million SA Der­by over 2450m. He should be at peak fitness for this race. He ran third in the Guineas over 1600m after a rest and followed it up with a facile victory in the Grade 1 SA Classic over 1800m. This will be his third run after a rest and should be ready to complete a per­fectly timed preparation for the Derby over 2400m which will be to his liking. Punters will have to take a short price though. Al Sahem has taken the same road to the Derby and finished runner-up in both the Guineas and SA Classic. He has the class but may be lacking in stamina over the 2400m. Stable compan­ion Furiosa was just behind him when staying on for third in the Classic and could finish close up again. Pagoda should relish the Der­by distance but has yet to meet the likes of Heavenly Blue and Al Sahem. However, he should be lengths ahead of the balance who make no appeal whatsoever. The Computaform Sprint could be fought out by Tarry-trained stable companions, mare Carry On Alice and gelding Trip To Heaven and they top betting boards. Both are top-class indi­viduals but because they are of the same age the latter was always over shadowed by his female sta­ble companion. However, their styles of racing are different. The mare is usu­ally up with the pace whereas the Trip To Heaven loses ground at the start. This could have a bear­ing on the result. If he doesn’t give too much ground away at the jump and can get a clear passage through a full field Trip To Heav­en could get up and grab Carry On Alice. Cape challengers Brutal Force and Jo’s Bond are not out of it. Bru­tal Force won his last two but was just nursed when striding short last time. If problem free could get into the action. Jo’s Bond makes her Highveld debut and if her prep has gone well must be considered. KwaZulu-Natal visitor Elu­sivenchantment meets Jo’s Bond on identical terms to when they recently raced at Scottsville and shouldn’t be able to turn it around. Best ‘roughie’ in the race could be Rafeef. He drops to the mini­mum distance but the blinkers could sharpen him up. Premier’s Champions Chal­lenge: 4-10 Legal Eagle, 9-2 Bra­zuca, 7-1 French Navy, 10-1 Nother Russia, 14-1 Deo Juvente 16-1 and better others. SA Derby: 13-20 Heavenly Blue, 7-2 AL Sahem, 4-1 Pagoda, 11-2 Fu­riosa, 25-1 and better others. Computaform Sprint: 22- 10 Carry On Alice, 28-10 Trip to Heaven, 7-1 Brutal Force, 8-1 Jo’s Bond, 12-1 Elusivechantment, 14-1 Rivarine, Moofeed, 16-1 and better others.